A Fleck control valve oversees the backwash of the filter, renewing and resettling the media bed, and renews the air pocket in the top of the treatment tank. Aeration turns “clear water” (ferrous) iron into “red water” (ferric) iron which is easily caught by a filter. With a Single Tank Aerator, both aeration and filtration can be performed in the same tank. The smaller sizes of the Birm and Catalytic Carbon filters shown below are offered with either the Fleck 5600 or Fleck 2510 control. For Filox, which requires a robust backwash and allows higher service flow, we offer only the 2510. With Birm and Catalytic Carbon, only the 2510 is offered for larger-sized units. Both controls use identical Fleck SXT programming. Both are reliable, proven performers. The 2510 has larger inner surfaces, two motors instead of one, and is in general a tougher, freer-flowing valve, but the lower priced 5600 is an excellent performer at lower flow rates. Highly effective single tank aeration/filtration units made with heavy-duty standard industry parts for the reduction of iron, manganese and hydrogen sulfide in residential well water. One of the most significant developments in recent years in the treatment of the persistent residential well water issues of iron and hydrogen sulfide is the development of aeration systems that put the filter and the aeration treatment in the same tank. Air is one of the most effective treatments for well water with the problems of rotten egg odor and red and black staining. Air adds no chemicals to the water, requires no routine maintenance, and is inexpensive to apply. Closed-tank aeration is a long established method for preparing iron, hydrogen sulfide, and manganese for removal by filtration. Closed tank aeration systems have until recently consisted of two separate treatment tanks: Air is introduced into the water in the first tank, then filtration of the “oxidized” particles is carried out in the second tank. The treatment units described on this page perform both functions, aeration and filtration, in a single tank. 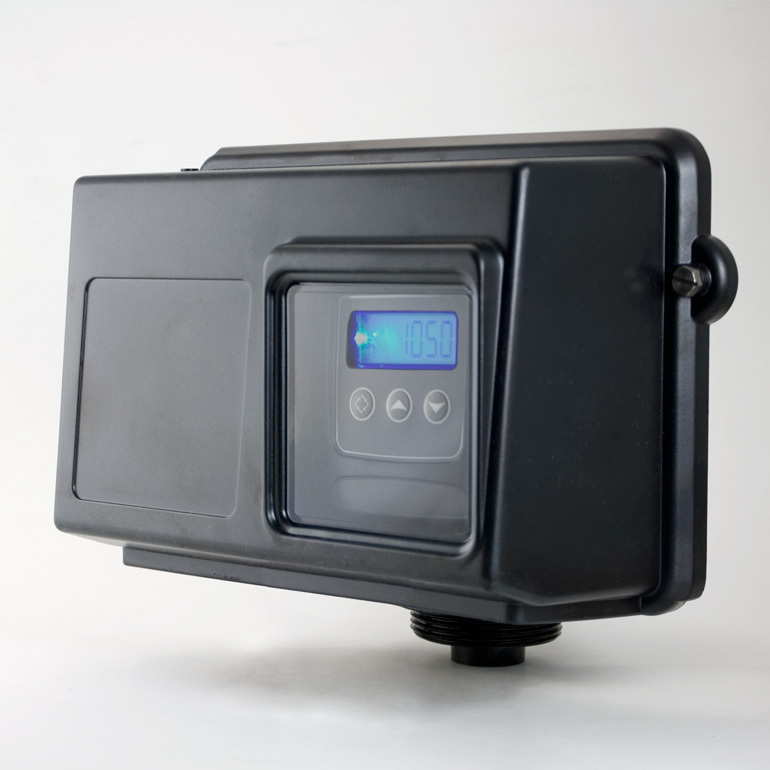 This single tank system uses the filter tank itself to perform the aeration. 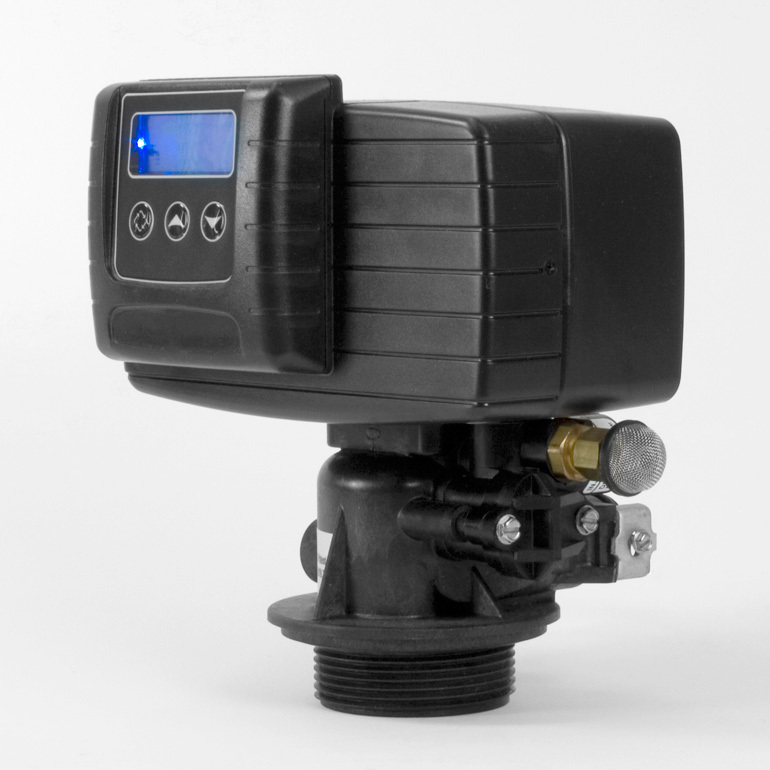 Single tank units require no electrical pumps, no solenoids, and no external venturis. Single tank units are compact, require little electricity, and are very easy to install, set up, and maintain. Most of all, they are very effective. 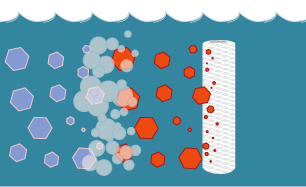 With our single tank aeration/filtration units, air is drawn into the treatment tank in the same way that brine is drawn into a water softener resin tank. During the nightly regeneration phase, air is pulled into the tank and water is expelled. As the tank refills with water, the air is compressed into a tight pocket that sits above the filter media. Water entering the tank sprays down through the air pocket, where contaminants are oxidized and prepared for removal by the filter media in the bottom 2/3 of the tank. In a single tank aeration system, the entire tank becomes an oxygen-rich chamber favorable to optimal performance by the filter media. Pure Water Products Single Tank Aeration Systems are based on our years of experience with closed tank aeration (see our AerMax units). They feature the superb Fleck SXT 5600 and SXT 2510 air induction control systems. For the single tank units we also use the superior Vortech mineral tanks which need no gravel underbed and can save up to 30% of water needed for regenerating the unit. It's the best compact aeration unit we can build, and we feel that it's the best single tank unit on the market. Single tank technology can be used with a variety of filter media. On this page we are presenting basic units with proven media, Birm and Centaur catalytic carbon, which work well with residential-sized aeration units and are very effective for contaminant levels to 5 to 8 ppm iron and hydrogen sulfide, and for service flow rates to seven or eight gallons per minute. For all-around performance for high levels of iron/manganese and hydrogen sulfide, we offer Katalox Light units that can handle higher flow rates and higher contaminant levels. Katalox Light also serves well for dirt and sand reduction. It is more durable and has a longer service life than either catalytic carbon or Birm. For more challenging water conditions with higher contaminant levels and where higher service flow rates are needed, we have Filox units. Filox is king of iron/manganese media, and following aeration it treats significant levels of hydrogen sulfide as well. We can also provide specialized single tank units with other media, like Calcite, Zeolite, Filter Ag, coconut shell carbon, and Iron Blend. Information and pricing upon request. The greatest single cause of failure of backwashing filters of all types is that the filter is too small to handle the required service flow or too large to be backwashed thoroughly with the output of the well. The filters on this page are sized for residential use. The service flow rates recommended are for stop and go household use. They are not intended for non-stop flow, as in an industrial application, or for the extended flow requirements of irrigation. Residential sizing allows a higher service flow than would be possible with continuous flow. The suggested service flow rates given below take liberties with traditional filter engineering, but we've found that they work well in residential situations. The backwash rate is more serious. Be sure you don't buy a filter that requires more backwash water than your well can put out. The filter will eventually fail. If in doubt, test your well's output. If your application needs a higher flow rate, we have other aeration options. Please call. Most filters sold on this page come with drain tubing, a media funnel, and a stainless steel bypass valve. We program the valve before shipping and provide you with programming details and instructions for changing the programming. For the two larger Filox filters, which require more than 7 gpm backwash flow, no drain piping is provided. Birm is a very popular moderate-duty iron treatment. It works especially well with aeration. Birm is relatively light and backwashes easily. It is effective with moderate amounts of iron, to up to seven or eight parts per million when conditions are right. It requires a pH of 6.8 or greater for iron reduction and 8 or more for effective removal of manganese. Birm is not effective with hydrogen sulfide. Birm does not work well with chlorination, but does extremely well with air. If you plan to chlorinate in front of the filter, Birm is not recommended. Single tank Birm filters are recommended for wells with up to five or six parts per million iron where the pH is 6.8 or above and odor is not a significant problem. Includes 1 cubic foot Birm, 9" X 48" Vortech mineral tank and Fleck 5600 AIO control valve. Includes 1 cubic foot Birm, 9" X 48" Vortech mineral tank and Fleck 2510 AIO control valve. Includes 1.5 cubic feet Birm, 10" X 54" Vortech mineral tank, and Fleck 5600 AIO control valve. Includes 1.5 cubic feet Birm, 10" X 54" Vortech mineral tank, and Fleck 2510 AIO control valve. Includes 2 cubic feet Birm, 12" X 52" Vortech mineral tank, and Fleck 2510 AIO control valve. Includes 2.5 cubic feet Birm, 13" X 54" Vortech mineral tank, and Fleck 2510 AIO control valve. Catalytic Carbon (Centaur) is the unchallenged best filter medium for reduction of the offensive odor in water commonly called hydrogen sulfide. Additionally, it removes moderate amounts of iron, improves the taste, and is also effective with reasonable amounts of chemicals in general. Catalytic carbon is granular filter carbon that has been specially conditioned for use with rotten egg odors and iron, but it also has all the chemical reduction capabilities of standard carbon. Single tank aeration units with Catalytic Carbon can be used with eight or nine parts per million hydrogen sulfide and up to two or three parts per million iron. Includes 1 cubic foot Catalytic Carbon, 9" X 48" Vortech mineral tank and Fleck 5600 AIO control valve. Includes 1 cubic foot Catalytic Carbon, 9" X 48" Vortech mineral tank and Fleck 2510 AIO control valve. Includes 1.5 cubic foot Catalytic Carbon, 10" X 54" Vortech mineral tank and Fleck 5600 AIO control valve. Includes 1.5 cubic foot Catalytic Carbon, 10" X 54" Vortech mineral tank and Fleck 2510 AIO control valve. Includes 2.0 cubic foot Catalytic Carbon, 12" X 52" Vortech mineral tank and Fleck 2510 AIO control valve. Includes 2.5 cubic foot Catalytic Carbon, 13" X 54" Vortech mineral tank and Fleck 2510 AIO control valve. Katalox Light is a natural zeolite product from Germany that has a generous 10% manganese dioxide coating but remains light enough to backwash with moderate amounts of water. It handles large amounts of iron (in excess of 10 ppm) and manganese, and is also very effective at odor (H2S) reduction. Katalox Light supports higher service flow rates than Birm and requires much less backwash water than Filox. 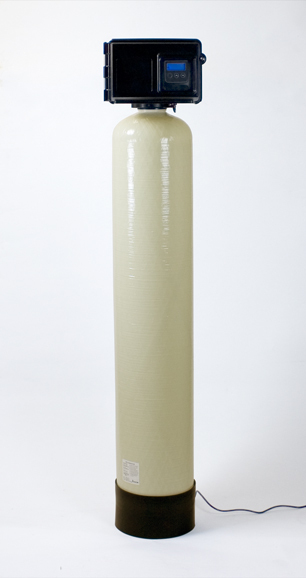 It is also valuable as a sediment filter, filtering particles down to three microns. Katalox Light is especially effective in single tank aeration units. It is a durable medium with a life expectancy of seven to ten years. Includes 1 cubic foot Katalox Light, 9" X 48" Vortech mineral tank and Fleck 5600 AIO control valve. Includes 1 cubic foot Katalox Light, 9" X 48" Vortech mineral tank and Fleck 2510 AIO control valve. Includes 1.5 cubic feet Katalox Light, 10" X 54" Vortech mineral tank and Fleck 5600 AIO control valve. Includes 1.5 cubic feet Katalox Light, 10" X 54" Vortech mineral tank and Fleck 2510 AIO control valve. Includes 2.0 cubic feet Katalox Light, 12" X 52" Vortech mineral tank and Fleck 2510 AIO control valve. Includes 2.5 cubic feet Katalox Light, 13" X 54" Vortech mineral tank and Fleck 2510 AIO control valve. Filox, the premiere iron/manganese/hydrogen sulfide medium, does especially well with aeration. It has limitations for residential users because of its density. In general, you can size Filox filters at least one tank-size smaller than Birm. Per size, Filox supports a higher service flow rate, but it also requires a more vigorous backwash. Filox removes odors well, works well with chlorine, and has a very long life. Daily regeneration is required. Backwash rates vary considerably with Filox according to water temperature (cold water requires less backwash water than warm), so please tell us when ordering if your water temperature is extreme. (Cold Water is defined as water of less than 60 degrees F.) The backwash values given below are averages. Be sure your well is capable of backwashing the filter you choose, because Filox must have a strong backwash. Includes 1.0 cubic foot Filox, 9" X 48" Vortech mineral tank and Fleck 2510 AIO control valve. Includes 1.5 cubic foot Filox, 10" X 54" Vortech mineral tank and Fleck 2510 AIO control valve. Includes 2.0 cubic foot Filox, 12" X 52" Vortech mineral tank and Fleck 2510 AIO control valve. Includes 2.5 cubic foot Filox, 13" X 54" Vortech mineral tank and Fleck 2510 AIO control valve. A discussion of the science behind aeration. Air pump systems for more agressive aeration treatment. Properties of the most common filter media.